Are you ready for the CP Million? The countdown to the Canadian Pacific $1 Million Grand Prix FEI CSI -5*, presented by Wells Fargo at HITS-on-the-Hudson in Saugerties, New York has begun! On Sunday, September 6 at 2 pm EST all eyes will be on the Grand Prix Stadium for what should be the United States’ highest ranked class in 2015. Over twelve nations will be represented and the globe’s top competitors will be present to battle it out for bragging rights and a $1 Million purse. Will Todd Minikus defend his champion title? Will McLain Ward make this his third $1 Million Grand Prix victory? Or will a new winner be crowned? 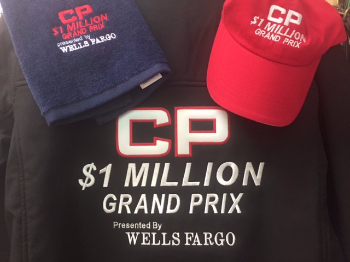 Whether you’ll be in the grandstands cheering or watching the live stream, wear your official CP Million jacket, t-shirt or cap with pride. Stop by Mona’s Monograms in Vendor Row to purchase your gear. Day VIP passes are still available for Sunday. $150 per person. Includes ringside seating, lunch courtesy of The Tavern at Diamond Mills, and complimentary beer and wine. Day VIP passes must be purchased in advance. To purchase Day VIP passes on Saturday, please see the Horse Show Office or call 845.246.5515. Not in Saugerties? No problem. The CP Million will be available to equine enthusiasts across the globe via HITS TV. Spectators can view all the action LIVE and free of charge. Click here to watch. In addition to the Million, a number of other Hunter and Jumper classes will be webcast live throughout the weekend. Click here to view the complete schedule. For more information on the CP $1 Million Grand Prix and the HITS Championship, visitwww.HitsShows.com.